Enhance the value and appeal of your entire home by partnering with our flooring specialists on your next home improvement project. Get the colors and textures that match your overall design plan by choosing from our expansive selection of stylish and durable vinyl flooring. Instead of limiting your options and paying too much for new home flooring, make the smart choice by visiting our showroom and working with our friendly team of sales associates. Each and every member of our staff is focused on your complete satisfaction. We go the extra mile to ensure you are able to find the vinyl tile flooring that fits the way you live your life. When you need a floor covering that is easy to clean and looks great for years, our vinyl sheet flooring is the answer. For a look of warmth and character that won’t cost you a fortune, choose from our selection of vinyl plank flooring. Get the best fit for your unique living space by taking advantage of our options for vinyl flooring installation. We match you with an installation contractor that is capable of completing your project according to your schedule. You deserve the finest floors in your home or office, and our team is ready to make that dream a reality for you. When you are in the market for a flooring option that combines traditional elegance with lasting durability our vinyl tile flooring makes a fantastic choice. 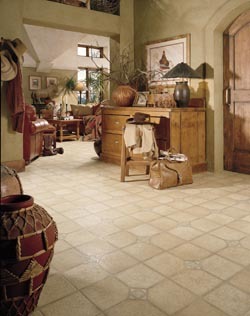 Vinyl tile allows you to expand your design horizon without giving up the visual appeal you have been searching for. In the hands of the right installation specialist, there is no end to the possibilities when it comes to distinctive patterns and original looks. Spend more time enjoying life with your family, and less time cleaning your floors when you install any of our options for vinyl sheet flooring. Your floors will be ready to live on in a snap, and the unbroken surface is less likely to provide areas where dirt can collect and hide. Your visitors and guests will marvel at the contiguous pattern this flooring affords, and you’ll appreciate the time that is saved on cleaning. Natural wood flooring is always a hit in any room, but the expansion and contraction that comes from moisture and temperature changes can present a design challenge. When you are searching for a way to enjoy the warmth and character of hardwood in places like your basement and kitchen, our vinyl plank flooring is the solution. Through an innovative manufacturing process, these floors give you the look and feel of wood without the limitations caused by contact with moisture. Every home presents a unique set of challenges for anyone planning a renovation or restoration. Getting the best fit for your flooring purchase is important to us, and that is why we offer options for quality vinyl flooring installation. We find the best installation professional for your particular project so that your investment is protected for many years to come. With the right tools and the modern flooring we offer, there is no limit to the possibilities for your home. Contact us today for a free estimate on new vinyl flooring for your new or renovated home. We proudly serve customers in Ann Arbor, Ypsilanti, Dexter, Saline, and Chelsea, Michigan, and surrounding communities.